Sip your way through Portland's vibrant downtown and sample some of the nation's best coffee on this 2.5-hour tour. Follow your guide as you discover the delights of house-made classic donuts, French canele, and an indulgent affagato that are all included with the price of your tour. See Portland's exciting downtown as you enjoy the city's unique coffee culture. Meet your guide at 10:30am at a downtown coffee shop to begin your tour. During this tasty coffee-tasting tour, you will not only learn volumes about the third wave of coffee, but also be treated to decadent delights throughout your time on this 2.5-hour walking tour. Meander through downtown Portland and discover 5-6 specialty cafes where you'll sample delicious coffee and house-made delights. Among the snacks offered, taste classic doughnuts, a French canele, and an indulgent affagato - a coffee-based dessert. Enjoy coffee made using a variety of brew methods, savor shots of the city's finest espresso, and visit the only food truck dedicated to roasting their own coffee. 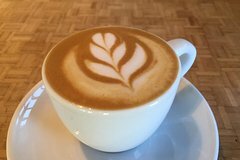 This is sure to be a crowd-pleasing tour for adults and kids alike, offering a taste of the coffee culture as well as the lively downtown Portland area.